Eduard van Beinum was one of the world's most benevolent conductors who cajoled out of his orchestras some of the most luminous sounds ever to be heard in concert and on record. 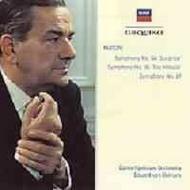 He recorded extensively with the Concertgebouw for Philips and earlier, for Decca. Three Haydn symphonies were recorded for Decca in 1951, 1952 and 1953 and they have been among the most requested orchestral reissues. Pirate versions have appeared but this is the first official Decca release on CD - and is something to be savoured. A treasurable release from the early 1950s. Van Beinum conducts exceptionally poised and vivacious performances in the very best Concertgebouw tradition of Haydn playing. The personality of the orchestra comes through in every bar, in both the woodwind solos and the pointed string bowing. ... Snap this up before it disappears!